Bi-Colored German Shepherd Dogs have two colors, BLACK and BROWN or GRAY or AGOUTI, (of one shade or another). 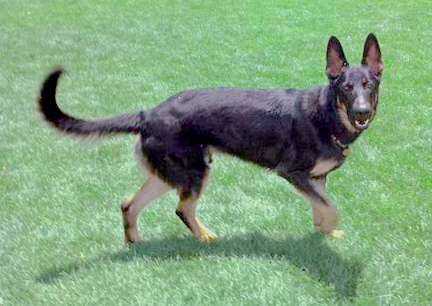 Bi-Colored GSD do not have the 'saddle' markings. Bi-Colored Dogs are Mostly Black. In fact, the color used to be called, "Almost Black". This is a photo of one of Tabaliah's Great x many Grand Sires from a few generations back in her pedigree (that goes all the way back to the 1800's when the Breed Began). Note how nicely and correctly this dog is built. Tabaliah's Sire is also Bi-Colored, but also has more brown coloring on his body and face. He is Lovely too! 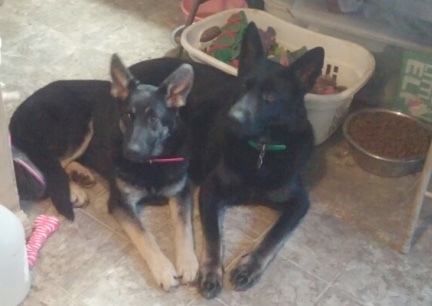 Many people, that own GSD, wrongly call Bi-Colored Dogs, Black Dogs. They are NOT Black. Bi-Colored GSD have their own unique beautiful coloring. 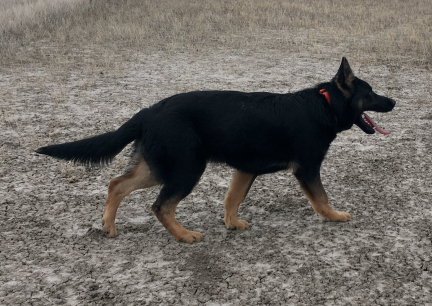 If a Black German Shepherd Dog has ANY Shade of Brown, Gray, Sable, in it's coat, usually the legs, it is a Bi-Colored Dog, NOT Black. 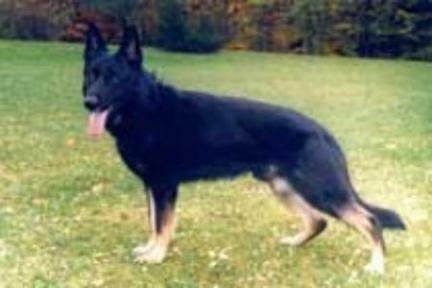 Thus, these markings on GSD USED to be called, "Almost Black". much more coming, new page. President John F. Kennedy and his family had many pets in the White House, one was a Bi-Colored German Shepherd Dog named Clipper. In the photo of Clipper standing, you can see he is a pup with nice markings. The Kennedy's were also Equestrians. Did you know that Caroline had a pony named, Macaroni!? In old Kennedy Home Movies, Newsreels, and Photos you will often see their GSD, Clipper, running with them as they rode their Horses and Ponies. 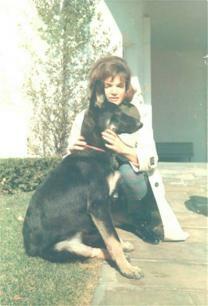 JFK Jr. also owned GSD in later years. 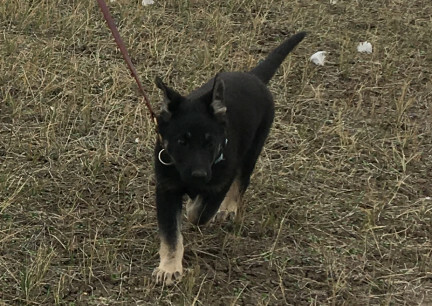 Photos of our own Bi-Colored GSD Dogs as puppies. 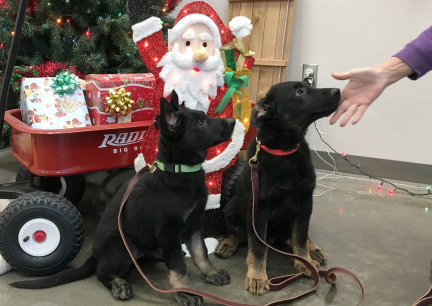 Tychicus and Tabaliah, out socializing, working on "sit-stay", in December of 2016 at Runnings in Belle Fourche, SD. The second photo if of Teanna, another of our dogs as a puppy. She is the daughter of Titus x Texas Tea. Photo to the right.......Teanna (in front), 6 months old, with Tabaliah 16 months old (ages at the time of photo). You could say that these 'colored dogs' Saved The Breed! That is, the lines they came from. The Working Lines! Photo of our own dog, Tychicus, at 5 months old. He is the son of Titus and Turquoise. The contents of this page for Bi-Colored GSD is still under construction. Please check back later to see more.